For the informed scooter buyer, here are the upcoming scooters in India that will be making their way to the market in 2018 and 2019. The Indian scooter market has seen an impressive growth in volumes in the past decade and the segment is steadily moving towards higher capacity models, even as the 100-110 cc segment continue to dominate the sales chart. No wonder then that the past year has seen new scooters in the 125 cc segment being launched. From the Honda Grazia, Aprilia SR 125, to the TVS NTorq 125, there have been a host of launches as manufacturers aim to capture a major of chunk of this ever growing pie. Clearly, the demand will be high in the years to come and more OEMs will be joining this bandwagon with new launches. 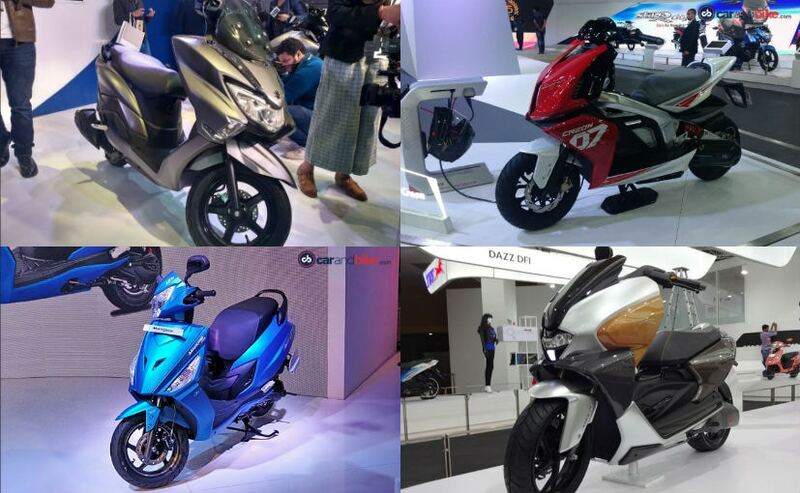 The Auto Expo 2018 provided us a glimpse of the upcoming scooter launches including concepts and production ready offerings that will hit the shelves over the course of the next one year. For the informed scooter buyer out there then, here are the upcoming scooters in India that will be making their way to the market over the next one year. Hero MotoCorp made its entry into the growing 125 cc segment. 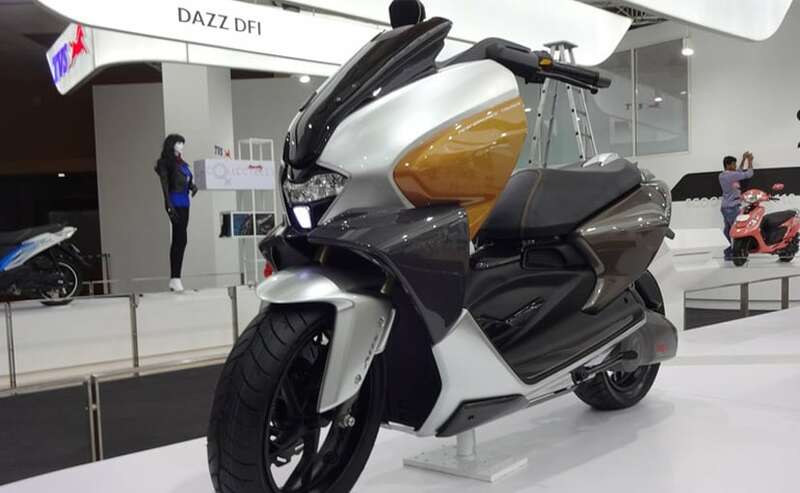 The two-wheeler maker revealed the Hero Duet and Maestro Edge 125 cc scooters at the Auto Expo 2018 in February, and while they may not be as exciting the Dare 125 concept was, the company does plan to launch these soon. The Hero Duet 125 is built on the existing Duet platform and gets a bored out engine as well as a few styling and feature upgrades. Most prominent is the addition of the i3S start-stop system that makes its way from Hero's motorcycle range on the scooter. Power comes from the new 125 cc single-cylinder air-cooled motor tuned for 8.7 bhp at 6750 rpm and 10.2 Nm of peak torque at 5000 rpm. As is the case with Hero products, the Duet 125 will be competitively priced, expected to start from ₹ 57,000 (ex-showroom). Joining the Duet 125, the Hero Maestro Edge 125 was also unveiled at the biennial event and shares its underpinnings and the engine with the former. 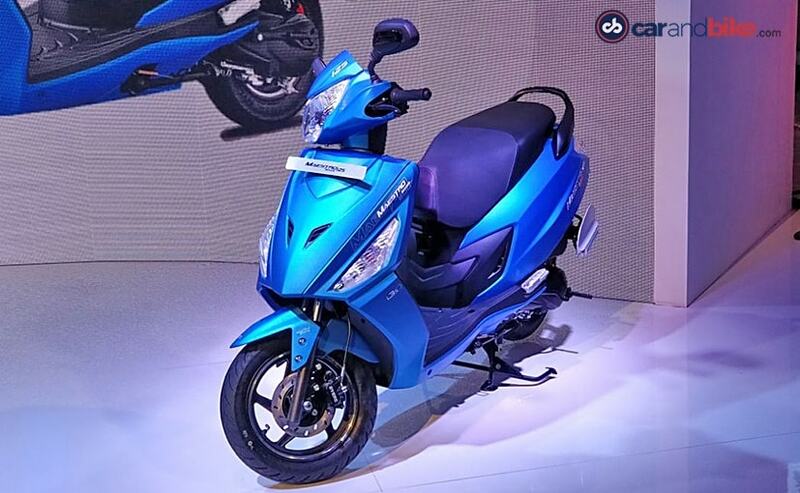 Compared to the Duet 125 however, the Maestro Edge 125 gets a sharper design targeted towards a younger set of buyers. Both scooters use the same engine in the same state of tune, while the feature list also remains the same with the i3S idle start-stop system, digital display, boot light, mobile charging socket, side stand indicator and more. Expect the Hero Maestro Edge 125 to command a slightly premium price tag over the Duet 125. The Suzuki Burgman Street 125 made its India debut at the Auto Expo 2018 and plans to take the scooter game up by a notch in the country. Styled on the lines of a maxi-scooter, the Burgman Street 125 borrows design cues from larger displacement Burgman offerings with a full bodywork, tall windscreen and a step-up style seat. The scooter also features a full-LED headlamp, digital instrument console, alloy wheels, and a segment first adjustable foot peg position. Power on the Burgman Street comes from the tried and tested 125 cc motor shared with the Access tuned for 10.7 bhp and 10 Nm of peak torque. The Suzuki scooter will be going on sale on July 19, 2018, and prices are expected to be around ₹ 69,000 (ex-showroom). With its unique styling and impressive feature list, the scooter is the one you should look forward to this year. 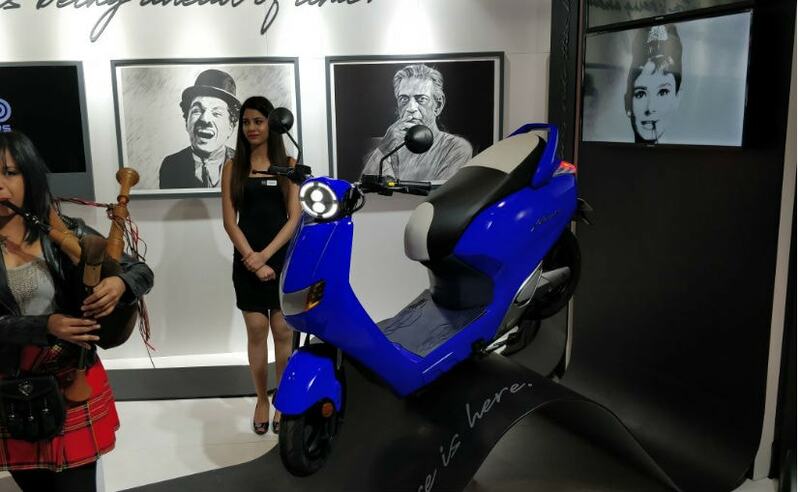 Indian start-up Twenty Two Motors launched the Flow electric scooter at the Auto Expo 2018 priced at ₹ 74,740 (ex-showroom, Delhi). The all-electric offering is India's first lithium-ion powered scooter gets a host of features including artificial intelligence, digital console, electronic braking, LED lights, geo-fencing and more. Power on the scooter comes from a DC motor that is powered by a lithium-ion battery and can produce up to 90 Nm of peak torque. The battery can be charged within a span of five hours and offers a range of 80 km with a speed of 60 kmph. Twenty Two Flow was expected to begin deliveries from June this year, as conveyed at the expo, but the company is yet to make an announcement on when the electric scooter will reach the first set of customers. The company will first commence operations from the Delhi NCR region, before expanding in other parts of the country. While Hero does produce electric scooters under its sister brand 'Hero Electric', the company is expected to develop its own offering as the segment begins to open up. 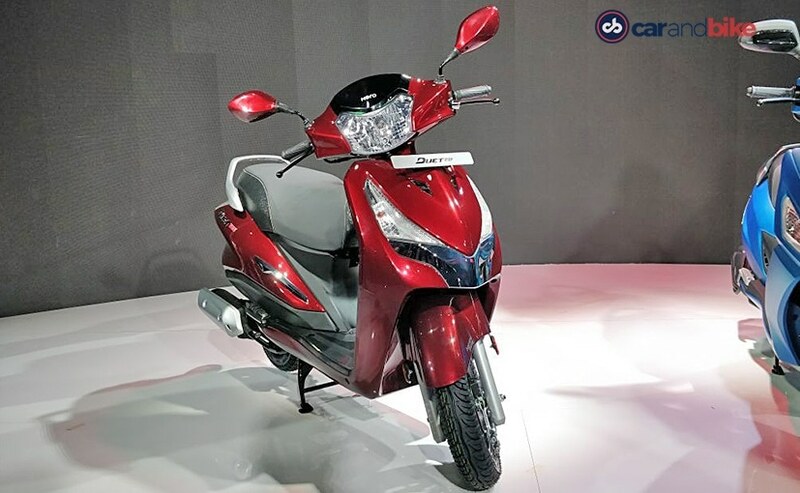 In fact, Hero MotoCorp also showcased the Duet E at the Auto Expo 2016 and its upcoming electric scooter could be based on the same. The Hero Duet E unveiled, shared its components with the standard model, while power came from an electric motor that can belt out 5 kW and 14 Nm of peak torque. Hero claimed a 0-60 kmph run in 6.5 seconds. 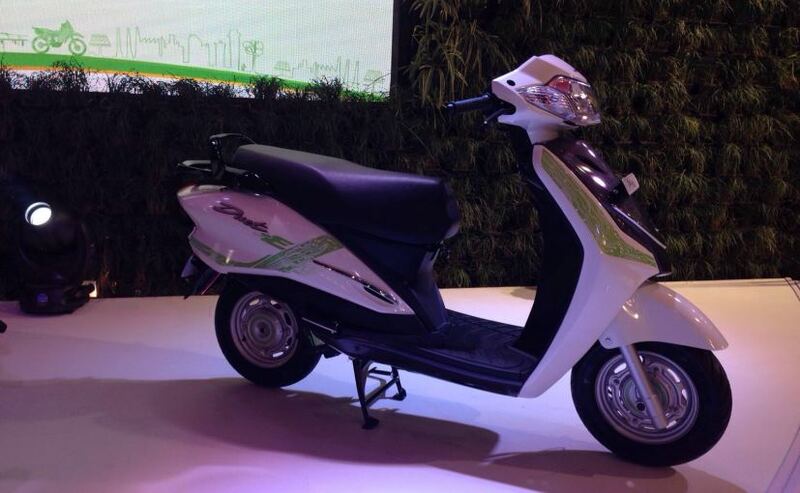 Hero also revealed at the expo that the scooter has a travel range of 65 km on a single charge. That said, Hero has not revealed any plans for its electric two-wheeler range yet. 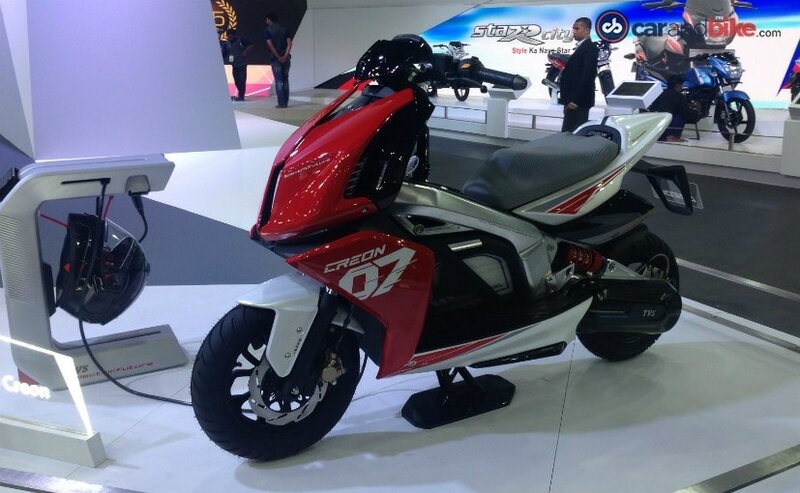 TVS Motor Company is also said to be entering the electric market soon and giving a glimpse of its future offering, the company showcased the Creon electric scooter concept at the Auto Expo 2018. Now, the two-wheeler maker does churn out production ready products from its concepts and it is likely that the bike maker will also introduce a Creon-based electric scooter in the future. At the time of unveil, the manufacturer described the offering as a "performance-oriented, electric scooter concept". The concept features a 12 kW electric motor with acceleration from 0-60 kmph in under 5.1 seconds and a claimed range of 80 km. The battery can be charged to 80 per cent capacity in just 60 minutes. TVS is yet to confirm details on the launch of the production-ready Creon, but we certainly hope to see this one hitting the markets soon. While operations for Mahindra 2Wheelers may have not panned out as the company hoped, it is quite likely that the Indian two-wheeler will take an early plunge into the electric two-wheeler space. 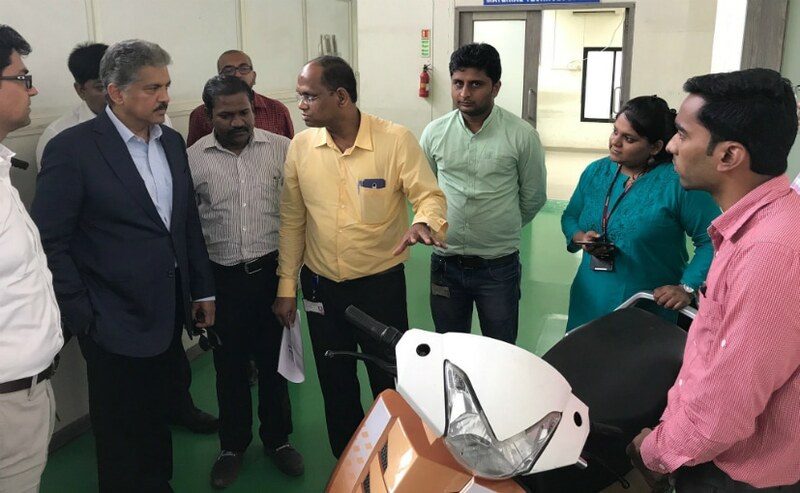 It is believed that Mahindra will be introducing an electric two-wheeler based on the Gusto scooter. Details though on the powertrain, range, top speed and charging are yet to be confirmed though. Mahindra is already working on electric two-wheelers internationally and in fact, sells the GenZe electric scooter in the US. We exclusively reviewed the Genze recently and learnings from the former will help in the development of the new electric scooters for India. That said, there are no confirmations about this from the company yet, but we do hope to hear something soon. While an electric scooter is in development from TVS Motor Company, a 150 cc scooter is all said to be in the works. While details on the new offering aren't out yet, the 150 cc scooter could take inspiration from the Entorq 210 concept that was showcased at the 2016 Auto Expo and will take on the Aprilia SR 150 and the Vespa 150 in the segment. 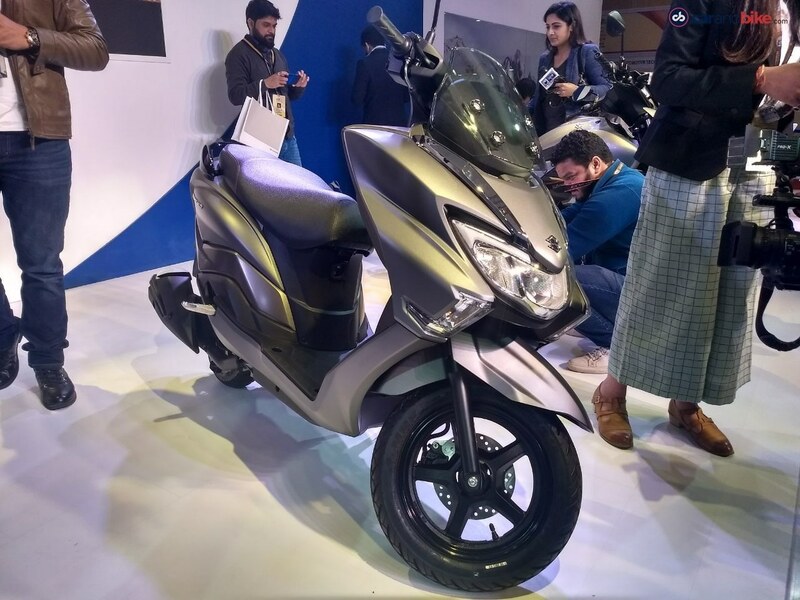 It will also be brand's most expensive scooter in the country, and going by what the NTorq 125 has to offer, this model is likely to come with a host of bells and whistles including the LCD instrument console, Bluetooth connectivity, navigation and a lot more. Being a 150 cc offering, the scooter will also have to come with ABS to meet the future safety norms. Recent reports suggest that a launch is scheduled sometime in 2019 and development is already said to be underway. This will be one launch we will be looking forward to.